I had an old Mason jar to use. Since I was pouring the liquid from inside a glow stick into the Mason jar, I used one I can live without. Not sure I would re use it after this craft. Even though I know that the liquid inside a glow stick are not toxic. Cut the top off the glow stick. Shake the Mason jar to get the liquid all over the inside. From the Canadian Association of Poison Control Centres (CPACC): 4th item down: GLOW STICKS: Glow sticks have a low order of toxicity. Biting into these can result in mild oral irritation. A splash in the eye can cause immediate stinging and burning sensation. This generally does not result in burns to the eye. These are so cute, and easy enough for the grandkids! Thanks! Awesome idea. I love how when you can use objects in new and fun ways. Pinned it. Oh I’ve seen these before but never tried it. Glad to hear it actually works! How long did it last???? It lasted through the night and the next day. The next night it was pretty much done. SO CUTE! I love this! Totally going to do this with Little One! Thanks for the amazing idea! Omg wow this is such a cool idea! I love it! And it’s so easy! Thanks so much for sharing! This will be a fun alternative! I love your creativity. That’s amazing. I’m sure all the little trick or treaters will be talking about your house. 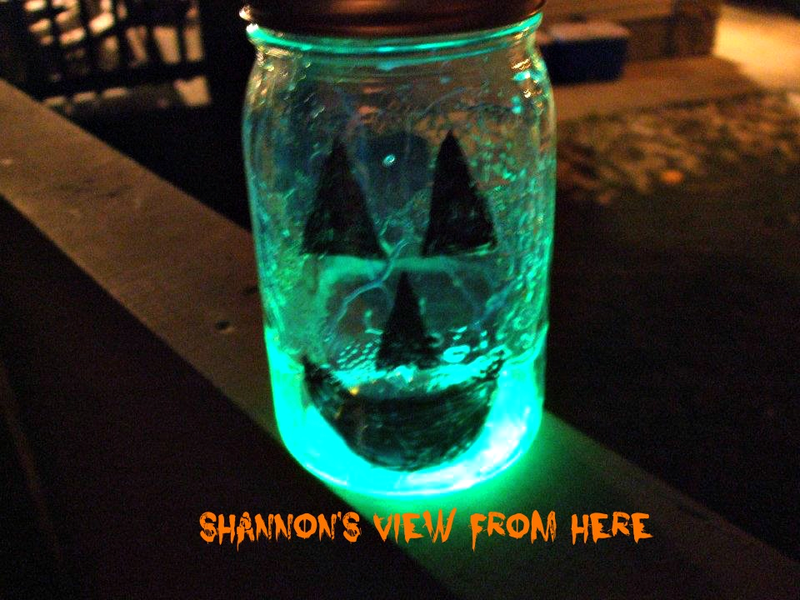 We did some mason jar glow jars in Summer while camping but these look awesome for Halloween. Great idea, creative, easy, and it looks great. Do you put that on your doorstep? Wow, it doesn’t get any easier than that and those are so cool looking. It would look great with a bunch of them going up your walkway. I saw something similar to this on another site, but you took it one step further with the Jack O Lantern Face. This is adorable. I would have never thought to do that. Very Creative and PERFECT for Halloween! I love this! I will have to give this a try! I am always looking for new and creative crafts to make with my babies! Thank you so much for sharing! That is seriously an easy awesome idea!! I’m getting stuff to make this and do it with the kiddo right before we leave to go trick or treating!! This is a cool idea, thank you for sharing it with us! Very cool. I think we’ll try a few of these Wednesday nite! OMG, this is an absolutely AWESOME and EASY craft to do. I’m not so crafty and this is totally something I can do. Thanks for sharing! I will be pinning this in Pinterest …My families favorite holiday is Halloween and I can not wait to try this …Seems simple enough and lots of fun! !